With musical roots in the early 80's L.A. club scene, with power pop band The Sneaks, Brett's honed his blend of Brit Pop & Americana influences into a powerful package on his 2009 'Red Light, Green Light, Go' CD, released in 2009 on Gateway Music in Denmark and Trough Records in the US. 'One of the best kept secrets of the Danish music scene, but not for long' POLITIKEN. RadioIndy is pleased to announced that we have published our CD Review of Brett Perkins music to CD Baby. FANS - Please checkout Brett Perkins online! RadioIndy created a CD Announcement Press Release for Brett Perkins on Digg.com! "Red Light, Green Light, Go" Reviewed by RadioIndy.com! 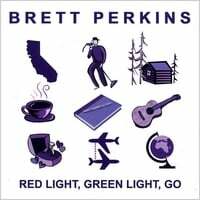 "Red Light, Green Light, Go" by Brett Perkins is an inspirational, easy listening Pop album. Each track delivers real instrumental, non-synthesized music with accurately harmonizing vocals. Greatly inspired by the work of The Beatles, "Red Light, Green Light, Go" does an exceptional job of combining the melodies of 60's pop with modern Americana guitars. The track "Figure It Out" has a perky, upbeat tempo and the chorus is probably the catchiest one of the entire album. The instrumentation on the track "I Won't Give Up On Love" matches the artist voice perfectly. Staying in the tenor range with a female vocalist accompanying him, this song is intricate in lyrics and musicianship. The Beatles have inspired many a great artist since the launch of their career and "Red Light, Green Light, Go" by Brett Perkins is a shining example of that. 2009 successes included a new album on the radio in Australia, Ireland, Denmark, the UK and US, recent song placement on MTV's Road Rules as well as a popular Danish television series, two First Place international songwriting competition wins (Great American Song Contest Pop Category & Australian Song Contest International Category), vocals on a national television ad in DK and several commercially released co-writes. 2009 also saw the founding of the Copenhagen Songwriters Festival, and expansion of the Listening Room International Songwriter Retreats and Concert Series.